For my mom's birthday in 2002, she wanted to have a bunch of us go to Film Night in the Park and see one of her favorite movies, Oh Brother Where Art Thou. I was of course delighted to make the cake, and very happily the date coincided with what John and I like to call "Golden Time" - that period of time when you leave one job before you start a new job and you've got lots of free time with no stress about money or returning to a desk of piled-up work. I took advantage of the time to attempt one of my more ambitious adventures in fondant. 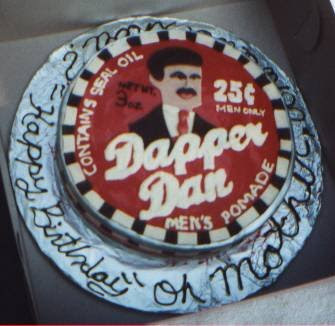 Dapper Dan Pomade plays a small yet pivotal role in "Oh Brother" (and has the pleasure of being run through George Clooney's hair) and is the perfect shape to be translated into cake. Dapper Dan himself is also fondant - I cut out the features from the photo of the prop and traced them onto rolled pieces of colored fondant, then reassembled them on the cake like a puzzle. Around foil on the cake circle I piped "Oh Mother, Where Art Thou?" It was so fun and relaxing to have a whole, free, uninterupted day to work on the cake. I was thrilled with how it came out, as was my mom. And, because I'm a big show-off, I loved carrying it through the crowds of people at the park and collecting all of the "oohs" and "aahs." Have ready a greased 1-cup heatproof glass measure near the range. In a medium bowl, beat the yolks with an electric mixer until light in color. Meanwhile, combine the sugar and corn syrup in a small saucepan (preferably with a nonstick lining) and heat, stirring constantly, until the sugar dissolves and the syrup comes to a rolling boil. (The entire surface will be covered with large bubbles.) Immediately transfer the syrup to the glass measure to stop the cooking. If using an electric hand-held mixer, beat the syrup into the yolks in a steady stream. Don't allow syrup to fall on the beaters or they will spin it onto the sides of the bowl. If using a stand mixer, pour a small amount of syrup over the yolks with the mixer turned off. Immediately beat at high speed for 5 seconds. Stop the mixer and add a larger amount of syrup. Beat at high speed for 5 seconds. Continue with the remaining syrup. For the last addition, use a rubber scraper to remove the syrup clinging to the glass measure. Continue beating until completely cool. Gradually beat in the butter and, if desired, any optional flavoring.. The buttercream will not thicken until almost all of the butter has been added. Place in an airtight bowl. Bring to room temperature before using. Rebeat to restore texture but not until it has reached room temperature to avoid curdling. The syrup must come to a rolling boil or the buttercream will be too thin. The egg/syrup mixture must be completely cool before adding the butter.